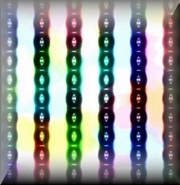 The Flatland Digital Artwork Clip Art Gallery: Glass beads. Beaded glass columns in teal, purple, blue, burgundy, crimson, apple green, aqua, cobalt blue, and red violet/magenta on a misty background in opalescent white, like essence of milk. A beautiful tile and one of my favorite pieces.